Easier to see on the big version (click through), but I think the girl in the bottom left and the sheer size and number of snowflakes probably sum up the state of Leeds today. 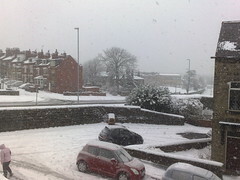 On the Twitter #uksnow thing I gave this 9/10. Out the back I cleared the snow off the top of the dustbin and two hours it was covered in an inch of snow. It looks nice but I’m bored of it now. Too cold, makes cycling too risky, and buses are too unreliable to get to the gym to train. Up above the trees and houses…. 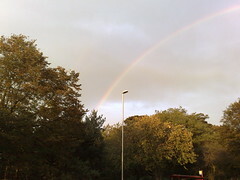 I was waiting for a lift to BJJ tonight when I noticed this rainbow over Hall Park in Horsforth. More than anything I was just curious to see if it would come out. Seems OK. I decided to try taking a few snaps during tonight’s bike ride. Still need to get the hang of getting the settings right, but I quite liked this one. 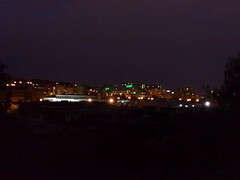 Student halls along Burley and Kirkstall Road taken from the canal.